At Spring Creek Dentistry, we understand that the thought of oral surgery can make any patient feel a little queasy. Your Spring dentists, Dr. Oakley, Dr. Henley, Dr. Miller, and Dr. Wendt want you to know that they are highly trained and experienced oral surgeons, and that all of your concerns will be addressed and taken seriously. Our doctors and staff are incredibly gentle and compassionate to ensure your experience is relaxed and comfortable. If you have a tooth that is badly damaged, decayed, broken, or failing, and is past the point of restoration, you may require a tooth extraction – or if you suffer from crowded teeth or bite misalignment. Not to worry, extractions are a fairly routine and painless procedure for our doctors at Spring Creek Dentistry. Use of antibiotics and type of anesthesia will vary on a case by case basis. We can safely remove the tooth in question, and set the stage for a restoration that will return your smile to its full form and function. We know root canals have earned a bad rap over the years, but the truth is, with advances in modern dentistry, root canals are a fairly routine and painless procedure. 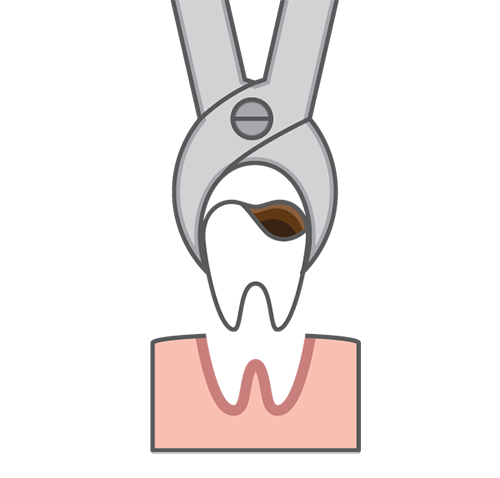 If you have a tooth that is infected within the tooth pulp or tooth root, you may require a root canal. Use of antibiotics and type of anesthesia will vary on a case by case basis. We will go in and remove the infection, sterilize and fill the chamber to prevent further infection, and seal the tooth with a crown. See now that wasn’t so bad, was it? If you are missing a tooth or multiple teeth, dental implants are the most recommended tooth replacement solution on the market, and the most secure way to restore your smile and preserve your oral health. Dental implants are small titanium posts that are surgically inserted into the gums and allowed to fuse with the jawbone, serving as a tooth root replacement. Implants preserve your oral structure and prevent the underlying jawbone from deteriorating, and serve as anchors for restorations like crowns and dentures. Check out our Dental Implants page for more info. If you have any questions about oral surgery, or would like to schedule a consultation with your Spring dentist – Dr. Oakley, Dr. Henley, Dr. Miller, or Dr. Wendt – please contact us at Spring Creek Dentistry today at (281) 407-8333 .